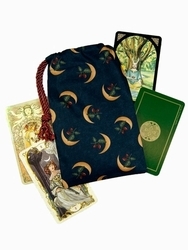 Twin acorns are gently held in the horns of a golden crescent moon, set on a deep navy background. 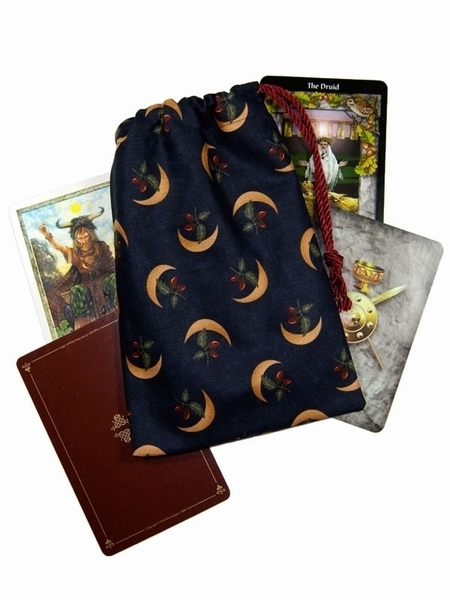 We've named this tarot bag "Druid's Moon." The crescent moons also bring to mind the golden sickles that Druids (supposedly) used to cut mistletoe from the top branches of the oak tree. 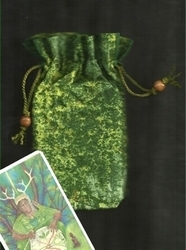 Acorn Symbolism: In the Celtic tradition the acorn is a symbol of the Druids and all the wisdom that entails. Though there are a few hypotheses about the meaning of the word Druid, one proposes that it means "oak knowledge." The oak and its seed, the acorn, are rich in meaning. The oak tree is a symbol of strength, patience, and wisdom. The acorn is, among other things, a symbol of potential and knowledge. 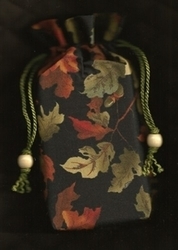 Many cultures around the world see the acorn as sacred. The Greek Goddess Diana is often shown with a necklace of acorns. The Norse God Thor took shelter under an oak tree in a violent storm. 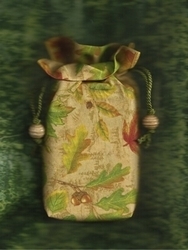 The acorn features in the myths of Romans, Germanic peoples, and some Native Americans tribes. Deck Suggestions: For standard-sized Celtic decks, such as the Arthurian Tarot by the Matthews and Gray or the Wildwood Tarot by the Carr-Gomms and Worthington , we have a Regular Druid's Moon Bag as well!